A false-color image of Titan's surface snapped by NASA's Cassini spacecraft on July 22, 2006. The lakes appear darker than the surrounding terrain because of the unique way they scatter radar, which is similar to how water lakes on Earth do it. 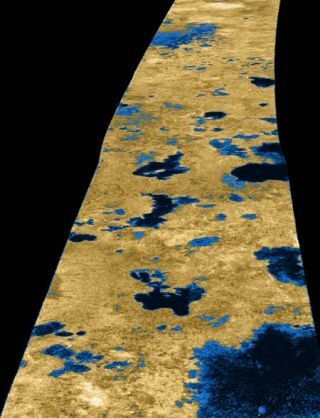 Images shotlast summer by NASA's Cassinispacecraft provide the strongest evidence yet that Titan, a saturnian moon and one of the mostEarth-like celestial bodies in the solarsystem, is dotted with a multitude of liquid lakes. "Atthe time we first announced it, we were like, 'Well, we think these areprobably lakes,' but that was about our level of confidence," said studyteam member Ellen Stofan of University College London and Caltech. "Iwould say at this point, we've analyzed the data to the extent that we feelvery confident that they are liquid-filled lakes." Instead ofwater, however, the Titanlakes [image]are likely filled with methane, and possibly even ethane, organic compounds thatare gases on Earth but liquid on the frigidsurface of Titan. "It'sgoing to behave like water," Stofan said about liquid methane. "It'stransparent just the way water is. So if you were standing by the shoreline,you would be able to see down to whatever pebbles or gunk that was on thebottom." Titan isthe only moon in the solar system to have a dense atmosphere with thin layersof methane and nitrogen clouds--a setup similar to that of earlyEarth. Atmospheric methane is destroyed by sunlight over time and mustconstantly be renewed. Scientists thus speculated that lakes or even oceans ofmethane might exist on, or just beneath, the moon's icy surface and thatevaporation from these liquid bodies was replenishing the atmosphere. The firstconfirmation of this thinking came last Julywhen Cassini's radar spotted more than 75 large, dark patches around thesurface of the moon's northern pole. "Thelakes are basically black in the [radar] data, which is how a liquid wouldbehave," Stofan said. Radar data alone wasn't enough, however. A verysmooth deposit of fine soil would also appear black on radar, Stofan explained. The clincherthat the patches were liquid lakes came from looking at the surroundingterrain. Some of the patches appeared to be fed by sinuous channels, or "rivers,"some more than 62 miles (100 kilometers) long. Others appeared to be containedwithin rimmed circular depressions, similar to crater lakes or volcaniccalderas on Earth. "Themorphological evidence points completely away from it being a smooth deposit ofsoil or sediment. It's just not consistent," Stofan said. "Combining thesetwo sets of data, it led us to feel very confident about the interpretationthat they're actually liquid." In a studypublished in the Jan. 4 issue of the journal Nature, the researchers alsosuggest that the rivers and lakes are being filled by rainfall from methaneclouds or by seepage from beneath the moon's surface. "Youcan think of all the exotic words you want to call it--a 'methanofer' becauseit's not an aquifer. It's a subsurface methane table and not a watertable," Stofan told SPACE.com. Theresearchers predict that as the seasons progress, lakes in the winterhemisphere should expand while those in the summer hemisphere should shrink ordry up entirely. Cassini isslated to perform 22 more Titan flybys, the next of which is scheduled forlater this month.